MELBOURNE: A focused Serena Williams sent an ominous Australian Open warning with a 49-minute first-round demolition on Tuesday as world number one Novak Djokovic destroyed his opponent as he targets a record seventh title. US Open champion Naomi Osaka also stormed through, but world number one Simona Halep was lucky to stay alive, needing to dig deep and claw back from a set down before beating Kaia Kanepi 6-7 (2-7), 6-4, 6-2. Meanwhile, French Open finalist Dominic Thiem went the distance against Benoit Paire before wrapping up a 6-4, 6-3, 5-7, 1-6, 6-3 win just after 2:00am to end day two’s entertainment. American giant Williams is bidding to match Margaret Court’s record of 24 Grand Slam crowns on her first return to Melbourne Park since winning in 2017 while eight weeks pregnant. Sporting a striking jade green jumpsuit and fine mesh stockings on Rod Laver Arena, the 16th seed wasted no time in getting out of the blistering Melbourne heat. Williams played at the mixed teams Hopman Cup in Perth this month, but her appearance on Tuesday was her first outing on tour since a meltdown in losing the US Open final to Osaka in September. Japan’s Osaka, seeded four, wasted little time in dispatching Poland’s Magda Linette 6-4, 6-2 and will next play Tamara Zidansek of Slovakia. Like Williams, Djokovic is also gunning for a slice of history as he looks to win a seventh title. Fellow six-time champion Roger Federer is aiming for the same. The Serb blasted past American qualifier Mitchell Krueger 6-3, 6-2, 6-2 to set up a clash with Jo-Wilfried Tsonga, who he beat in Melbourne to win the first of his 14 Grand Slam crowns back in 2008. 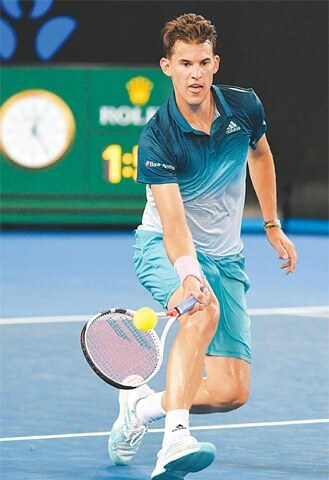 Fourth seed Alexander Zverev, who is looking to win his first Slam title and establish himself as a serious threat to Djokovic, Federer and Rafael Nadal, cruised past Aljaz Bedene 6-4, 6-1, 6-4. But eighth seed Kei Nishikori, who won in Brisbane last week, had a lucky escape. Elsewhere, 2014 champion Stan Wawrinka benefited from an opponent pulling out, with Ernests Gulbis calling it quits after hurting his back in the second set. Among the women, sixth seed Elina Svitolina easily progressed, as did Williams’ sister Venus, who incredibly played her first Grand Slam tournament 22 years ago. But two-time champion Victoria Azarenka was bundled out, along with 10th seed Darya Kasatkina. 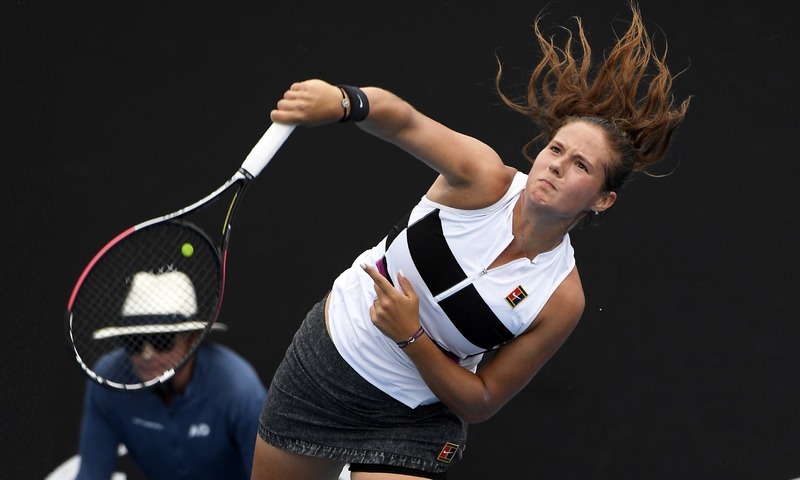 Seventh seed Karolina Pliskova, who has made the quarter-finals in her last two appearances at Melbourne Park, went through, as did American Madison Keys, who reached the semis at the French and US Open last year. First round: 1-Novak Djokovic (Serbia) bt Mitchell Krueger (US) 6-3, 6-2, 6-2; Jo-Wilfried Tsonga (France) bt Martin Klizan (Slovakia) 6-4, 6-4, 7-6 (7-5); Taro Daniel (Japan) bt Thanasi Kokkinakis (Australia) 5-7, 4-2 — Kokkinakis retired; 25-Denis Shapovalov (Canada) bt Pablo Andujar (Spain) 6-2, 6-3, 7-6 (7-3); 21-David Goffin (Belgium) bt Christian Garin (Chile) 6-0, 6-2, 6-2; Marius Copil (Romania) bt Marcel Granollers (Spain) 6-3, 6-4, 6-4; Ryan Harrison (US) bt Jiri Vesely (Czech Republic) 6-0, 7-5, 6-3; 15-Daniil Medvedev (Russia) bt Lloyd Harris (South Africa) 6-1, 6-2, 6-1; 12-Fabio Fognini (Italy) bt Jaume Munar (Spain) 7-6 (7-3), 7-6 (9-7), 3-1 — Munar retired; Leonardo Mayer (Argentina) bt Nicolas Jarry (Chile) 7-6 (7-4), 7-6 (7-3), 4-6, 6-3; Ilya Ivashka (Belarus) bt Malek Jaziri (Tunisia) 4-6, 7-6 (8-6), 6-1, 4-0 — Jaziri retired; 23-Pablo Carreno-Busta (Spain) bt Luca Vanni (Italy) 6-7 (5-7), 2-6, 6-3, 7-5, 6-4; 32-Philipp Kohlschreiber (Germany) bt Li Zhe (China) 6-2, 6-2, 6-4; Joao Sousa (Portugal) bt Guido Pella (Argentina) 7-6 (7-2), 4-6, 7-6 (7-5), 4-6, 6-2; Ivo Karlovic (Croatia) bt Hubert Hurkacz (Poland) 6-7 (5-7), 7-6 (7-5), 7-6 (7-3), 7-6 (7-5); 8-Kei Nishikori (Japan) bt Kamil Majchrzak (Poland) 3-6, 6-7 (6-8), 6-0, 6-2, 3-0 — Majchrzak retired; 4-Alexander Zverev (Germany) bt Aljaz Bedene (Slovenia) 6-4, 6-1, 6-4; Jeremy Chardy (France) bt Ugo Humbert (France) 3-6, 7-6 (8-6), 6-4, 6-7 (4-7), 7-6 (10-6); Alex Bolt (Australia) bt Jack Sock (US) 4-6, 6-3, 6-2, 6-2; 29-Gilles Simon (France) bt Bjorn Fratangelo (US) 7-6 (7-2), 6-4, 6-2; 24-Chung Hyeon (South Korea) bt Bradley Klahn (US) 6-7 (5-7), 6-7 (5-7), 6-3, 6-2, 6-4; Pierre-Hugues Herbert (France) bt Sam Querrey (US) 5-7, 7-6 (8-6), 6-3, 6-1; Stan Wawrinka (Switzerland) bt Ernests Gulbis (Latvia) 3-6, 3-1 — Wawrinka retired; 16-Milos Raonic (Canada) bt Nick Kyrgios (Australia) 6-4, 7-6 (7-5), 6-4; 11-Borna Coric (Croatia) bt Steve Darcis (Belgium) 6-1, 6-4, 6-4; Marton Fucsovics (Hungary) bt Albert Ramos (Spain) 6-3, 6-4, 6-7 (5-7), 6-3; Evgeny Donskoy (Russia) bt Laslo Djere (Serbia) 6-7 (5-7), 6-4, 6-1, 7-6 (7-5); Filip Krajinovic (Serbia) bt 17-Marco Cecchinato (Italy) 4-6, 0-6, 6-1, 7-6 (10-8), 6-4; 28-Lucas Pouille (France) bt Mikhail Kukushkin (Kazakhstan) 6-1, 7-5, 6-4; Maximilian Marterer (Germany) bt Gleb Sakharov (France) 6-3, 6-1, 6-3; Alexei Popyrin (Australia) bt Mischa Zverev (Germany) 7-5, 7-6 (9-7), 6-4; 7-Dominic Thiem (Austria) bt Benoit Paire (France) 6-4, 6-3, 5-7, 1-6, 6-3. First round: Sofia Kenin (US) bt Veronika Kudermetova (Russia) 6-3, 3-6, 7-5; Alize Cornet (France) bt Lara Arruabarrena (Spain) 6-2, 6-2; Venus Williams (US) bt 25-Mihaela Buzarnescu (Romania) 6-7 (3-7), 7-6 (7-3), 6-2; 23-Carla Suarez (Spain) bt Clara Burel (France) 7-5, 6-2; Dayana Yastremska (Ukraine) bt Samantha Stosur (Australia) 7-5, 6-2; Eugenie Bouchard (Canada) bt Peng Shuai (China 6-2, 6-1; 16-Serena Williams (US) bt Tatjana Maria (Germany) 6-0, 6-2; Timea Bacsinszky (Switzerland) bt Darya Kasatkina (Russia) 6-3, 6-0 Natalia Vikhlyantseva (Russia) bt Varvara Lepchenko (US) 6-7 (2-7), 6-2, 6-4; Johanna Konta (Great Britain) bt Ajla Tomljanovic (Australia) 7-6 (7-4), 2-6, 7-6 (10-7); 18-Garbine Muguruza (Spain) bt Zheng Saisai (China) 6-2, 6-3; 27-Camila Giorgi (Italy) bt Dalila Jakupovic (Slovenia) 6-3, 6-0; Iga Swiatek (Poland) bt Ana Bogdan (Romania) 6-3, 3-6, 6-4; Madison Brengle (US) bt Misaki Doi (Japan) 6-4, 6-0; 7-Karolina Pliskova (Czech Republic) bt Karolina Muchova (Czech Republic) 6-3, 6-2; Tamara Zidansek (Slovenia) bt Daria Gavrilova (Australia) 7-5, 6-3; Laura Siegemund (Germany) bt Victoria Azarenka (Belarus) 6-7 (5-7), 6-4, 6-2; 28-Hsieh Su-wei (Taiwan) bt Stefanie Vogele (Switzerland) 6-2, 6-1; 21-Wang Qiang (China) bt Fiona Ferro (France) 6-4, 6-3; Aleksandra Krunic (Serbia) bt Zarina Diyas (Kazakhstan) 3-6, 7-5, 6-1; Bianca Andreescu (Canada) bt Whitney Osuigwe (US) 7-6 (7-1), 6-7 (0-7), 6-3; 13-Anastasija Sevastova (Latvia) bt Mona Barthel (Germany) 6-3, 6-1; 12-Elise Mertens (Belgium) bt Anna Karolina Schmiedlova (Slovakia) 6-2, 7-5; Margarita Gasparyan (Russia) bt Lin Zhu (China) 4-6, 6-2, 6-2; Anastasia Potapova (Russia) bt Pauline Parmentier (France) 6-4, 7-6 (7-5); 17-Madison Keys (US) bt Destanee Aiava (Australia) 6-2, 6-2; Zhang Shuai (China) bt 26-Dominika Cibulkova (Slovakia) 6-2, 4-6, 6-2; Kristyna Pliskova (Czech Republic) bt Anna Blinkova (Russia) 7-6 (7-2), 2-6, 6-2; Viktoria Kuzmova (Slovakia) bt Kateryna Kozlova (Ukraine) 4-6, 6-4, 6-2; Elina Svitolina (Ukraine) bt Viktorija Golubic (Switzerland) 6-1, 6-2; 1-Simona Halep (Romania) bt Kaia Kanepi (Estonia) 6-7 (2-7), 6-4, 6-2; 4-Naomi Osaka (Japan) bt Magda Linette (Poland) 6-4, 6-2. Best of luck to the Williams sisters in quest for yet another grand slam title under their belt in Australia. Keep it up and hang on tough. With unity, faith, dedication and discipline, you can win the just started 2019 Australian Open Tennis Tournament.